The Buenos Aires government and a group of advertising associations have agreed to remove 40 thousand billboards that are infracting the city’s code, Clarin newspaper informed. This represents about 60% of the total amount of billboards. 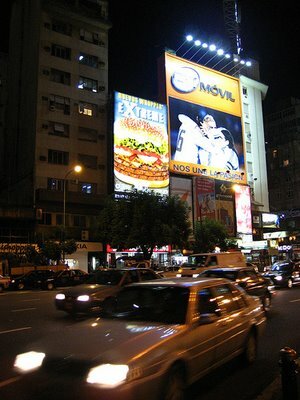 This agreement is part of a government plan to put in order outdoor advertising in Buenos Aires, which includes modifications to the advertising code to establish areas in the city and authorize different types of signs according to the neighborhoods’ characteristics. The government’s goals are to reduce visual pollution, improve the neighbors life quality and prevent accidents. Even though visual might not be the worst pollution the city has to deal with, the amount of signs that have emerged during the last years and the dangers some of them represent make this plan a step in the right direction. More details and images of how the city would look like, in the extended. The initiative to put in order the city’s outdoor advertising began last May, when the government sent a law project to the Congress and approved a resolution to stop new authorizations for billboards and signs. -It establishes three areas in the city: residential, commercial zone and the Republic Square. In the first area, some signs will be allowed, but only small ones to indicate a shop’s activity; in the second area there will be drastic cuts to advertising; and the third will be the only one to allow big signs and electronic billboards, but there will be new regulations. -The law also establishes new parameters for signs, such as lightning and allowed colors. -It also forbids the total covering of facades, some kinds of billboards, and the installation of signs on apartments and houses. The city’s Public Space Minister, Juan Pablo Piccardo, told Clarin newspaper that today Buenos Aires has signs with all types of infractions, from billboards in forbidden areas to others installed in terraces that are over the allowed height. Image showing how the center of Buenos Aires would look with the new regulations. Source: Pagina 12 newspaper. Businessmen from the advertising sector of course reacted, with a campaign claiming that less signs mean less voices that speak to the population with messages that can be useful for society. However, they agree to the fact that the segment needs organization since a growing number of billboards means they are less valuable and therefore cheaper to rent. The group got to an agreement with the government last August 7, when the mayor’s office proposed to take down the measure that established it would not give permissions for new billboards in exchange for the companies to take down the illegal signs.